So... you think you play Frisbee. Alrighty then, I'll take your word for it. Maybe you think you're good. Very well, I'm not doubting you. Perhaps you even think you're hard-core. OK, that you'll have to prove it to me. But if you think could have out-hard-cored those of us who played for the entire duration of the Eagle River Frisbee Solstice Game -- if you think you would have tried playing your finest for the whole two hours of freezing and soaking rain; if you think would have stayed on that field until your fingers were numb, and then some; if you think you would have dove on the ground mercilessly, hoping against all odds that maybe this time the slippery disk would stay in your hands; if you think you would have tossed off your clothing and played shirtless, just to spite the rain -- if you honestly believe that your could have out-hard-cored all that, then let me put it simply: I must marry you. Now. The Solstice game was quite the game -- believe me. We started at 10pm under drizzling rain, and ended a bit past midnight under progressively harder rain. It was light when we started, and still light when we ended -- thank God for the crazy Alaskan summers. But it wasn't just a Solstice Game: it was a friendly face-off between our group and the "Church Kids" who usually play in their own huge group on Friday afternoons. This was the Game to prove all Games. And, ask anyone, this game was quite spectacular. We were outnumbered at first. Not too badly outnumbered (25 against 20 or so), but outnumbered non-the-less. We were playing on a large football field, but even so the amount of people on each team was somewhat mind-boggling. We weren't too careful with our passes at the beginning, so we lost two points in the first several minutes of the game. But the reality of the playing situation soon caught up to us, and both our offense and our defense soon became more focused. We scored several points in a row, playing with far more skill and awesome catches and defense than I ever remember us playing before, and ended up winning the first set 7-5. We decided to play a second game. This game was starting to get harder, as the cold and the soaking rain were beginning to take their toll. The game, for both sides, became a series of catastrophic turnovers and heroic catches. We sprinted, we leaped, we dove... and we missed far too much. One-handed catches became impossible -- even two-handed catches failed left and right as the slippery Frisbee flew right in between our numb hands. We shivered, we did desperate jumping jacks in an effort to maintain our body temperatures, but the game went on. And, cold as I was -- cold as we ALL were -- I would not have traded that game for anything else in the world at that given moment. The second game was particularly close. We were playing "first team to score five points wins", but at 4-3 us, the other team put up an amazing defense and blocked a dozen different passes that were all within ten yards of the scoring zone line. Taking over the disk after that dozen turnovers, the "Church Kids" flung the disk down a chain of people, and got another point. The score became 4-4, and the next point would determine the winner. For both teams, it was now or never (or, at least, not until another Solstice game). This WAS the ULTIMATE SHOWDOWN -- "Ultimate" both in the sense of this particular glorious game, and in the equally glorious nature of the sport itself. After numerous attempts, desperate war cries, and praises to Allah, Buddha, Zeus, and, (last but not least), Jesus, our team finally scored the last point of the beautiful and hard-core game between our Eagle River Frisbee Team and the Frisbee team of the "Church Kids". Was the game worth the frozen limbs? YOU BET! Were there some pretty amazing runs and catches and blocks done by all, "Church Kids" definitely included? ABSOLUTELY! Did we all turn up the heat in our cars as soon as we got done with the game? HELL YEAH! And will we do this again next summer? YOU BETTER BELIEVE IT! AND YOU BETTER SHOW UP TO THAT GAME, TOO! I will end this post with our team's motto, formed jointly over Christmas Break: "Dish with accuracy. Chase obsessively. Run like there is no tomorrow. LIVE ULTIMATE!" Oh my God -- this story gets better. Hm... would I like to? Yeah, ok. No idea why those particular times at night, but that must have been Pacific Time or something for when I posted the Blog. Either way, sure, no problem. 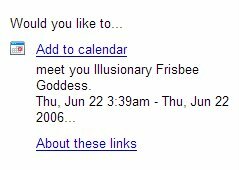 Call me, Illusionary Frisbee Goddess! I won't be asleep. Heck, in Alaska it will be light by that time in the morning! no wait i have another: fanatic. runners up include: maniac, freak, devotee, and nut-case.